Growing up in the South, as many of you can probably relate, I was taught that, if you don’t have anything nice to say about someone, don’t say anything at all. Generally speaking, that’s a good rule to live by in a polite society, and generally speaking, I try to abide by that. Recently someone dear to me asked me why I spent so much time bashing our current president, suggesting maybe I should revisit the rule about what to do when not having anything nice to say. I imagine she had grown tired of what I’m sure seems an incessant drumbeat of negativity on my part, and I can understand that. So if I don’t have anything nice to say, why can’t I just say nothing at all. It’s a fair question, and one that I’m sure if you hold political traditions in high esteem, or if you’re indifferent to politics, or if maybe even your sympathetic to our current president, you’ve probably asked this about me yourself. Why does he keep banging on about Trump, why can’t he give it a rest already. He hates Trump, we get it. Shut up already. I want to answer that question, but first, in my defense let me point out, I have scaled back recently. I’m focusing much more attention on puppies and kittens, and trying to only post about Trump only when he does something even more egregious than the last horrible thing he did. So, if I don’t like Trump, why can’t I just be quiet about it? Lots of people didn’t like Obama, you didn’t hear them complaining. Well, you did, but that’s beside the point. There is no Trump/Obama equivalency, moral, political, or otherwise. This president, and his presidency, is fundamentally different than all previous presidents. All of them. Yes, even Nixon, although he is probably the closest. This president is different, deeply fundamentally different, and not in a good way. If you do not yet grasp that, you may as well stop reading now. Most presidents you can give the benefit of the doubt. I didn’t think Obama was qualified to be president, but I didn’t think he was the Devil incarnate either. I think he meant well, I think his heart was generally in the right place, and I think he did the best he knew how, given a difficult situation. This is the same thing I thought of George W Bush before him, and Bill Clinton before that, and Bush 41 and Reagan before them. I would have widely differing opinions of their results, but I never really questioned their motives. I never doubted their goal was truly to “serve” as president. This president does not mean well, his heart is not in the right place. He is not there to serve. He is there for himself, his ego, and his business interests. He has no moral center, no character. He is a narcissistic psychopathic megalomaniac on his best day. He is not, by any measure, a good person. He is, by many different measures, a bad man. Beyond that, he means to do harm. He carves out whole groups of people as scapegoats, on which to blame all of America’s problems. It is literally how he began his campaign. This not only ensures that things go badly for the scapegoats, but it also guarantees that we never get around to addressing the real causes of our problems. He has normalized racism and hatred. He has made it acceptable, almost fashionable. He, and his policies, and the people he has tried to surround himself with, present a clear and present danger to us as a nation and as a people. He is a danger to our very humanity. He threatens who we are, at the deepest level. When I was in Washington DC earlier this year, we visited the Holocaust Museum. This is not an easy museum to visit, at least not if you have anything approaching human emotions, but it is important, and I would urge anyone who has the opportunity, to visit, if even for a little while. This trip was short and by intention largely improvised, so we were unable to see the regular exhibit, but we instead took in a special exhibit called “Some Were Neighbors: Collaboration and Complicity in the Holocaust”. It examined the German culture early on, before the camps and the trains and Krystallnacht, and the other “big” events. It didn’t start big, it started slowly, quietly. In the early days, Germany’s president and chancellor portrayed immigrants and Jews as the source of their country’s problems. Change “Immigrants and Jews” to “Illegals and Muslims” and you can hear exactly the same rhetoric today. The exhibit examined not so much the early slights and harassments and persecutions of those people, but rather looked at the responses of the typical Germans. These were all ordinary everyday people, presumably good people. Yet some joined in, while others helped protect and defend the victims. Some spoke out, but many simply looked the other way, choosing to say nothing, do nothing, to mind their own business. They had nothing good to say about their government, so they said nothing. We see these same occurrences, and these same responses, today. The exhibit focused on facts and actions, and tried hard not to pass judgement or ascribe intent on those who chose to stay on the sidelines, but it is frightening when you understand just how easy it is for “good people” to look the other way when bad things begin to happen. Some joined in, some opposed, some looked the other way. I knew, right then, right there, what sort of person I wanted to be. This is not easy. I am still trying to figure out what it means to be that sort of person, and I may annoy many of you in the process, but I know, at least a part of it is, that I cannot be silent. We bought coins in the museum’s gift shop. 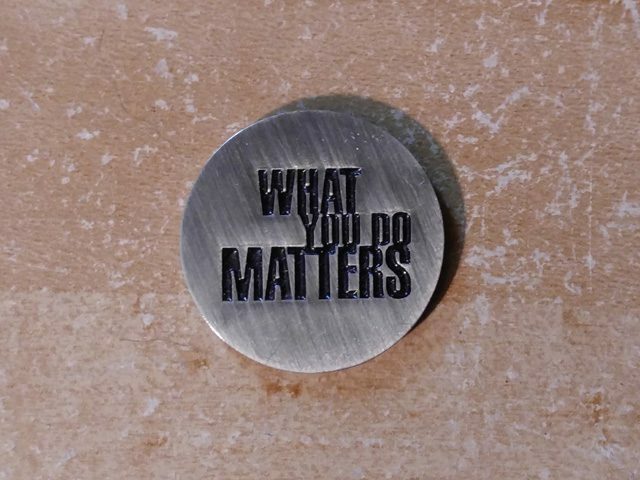 They are plain metal slugs, that say simply “What you do matters”. I keep my coin with me, if not in my pocket, then on my desk or kitchen counter, but always in nearby. I see it every day. And it reminds me, every day, that what I do matters. That is why I cannot, and will not, remain silent about the actions and character of our current president. Some of this may sound like snark, and admittedly, some of it is, that’s a part of my nature that stubbornly refuses to be repressed. But, there are important things happening, bad things, on many, many different fronts, all swirling around the train wreck that is our executive branch, and while that remains true, I will not remain silent.